Who? Thai military stormed into the Red-shirts protest area clashing with anti-government activists. What? Violence broke out as Thai army and supporters of the anti-government movement clashed. Some reports say as many as 10 people died in Wednesday’s violence. Where? Heavy clashed and rioting took place in Bangkok when troops moved to regain control of several districts of the Thai capital from Red-shirts protesters. Dozens of buildings including the Bangkok stock exchange were set on fire by enraged demonstrators. The city is under a curfew now. When? The rioting and clashes took place when military tried to clear off Red-shirts dominated areas of Bangkok on Wednesday morning on 19 May. Why? The military action was taken after Vejjajiva administration refused to negotiate with the opposition leaders and arrested them after 10 weeks-long stand off. 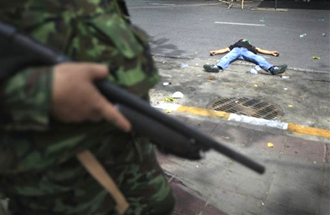 Red-shirts protesters resorted to violence when Thai military imposed a clamp down and began shooting at them. How? While Thai army moved into Red-shirts controlled areas in armored personnel carriers (APCs) after issuing shot on sight notices to the protesters, the retreating activists resorted to rioting and arson, using home made bombs and crude explosives to set buildings on fire.